It was truly a team penning clinic. And these three performed like physicians . . . making an extremely long-distance house call. Brothers Joel and Jordan Lesh of Stillwater, Okla., and fellow professional team penner Brian Buckner of Magee, Miss., cashed in on their cross-continent journey to the Calgary Stampede on Sunday evening – claiming the championship in the Open Class Team Cattle Penning Competition, presented by Calfrac Well Services, at the Scotiabank Saddledome. Victory is worth $10,266, split three ways . . . and should be good for a little gas in the hauler en route to their next go-round. The Stampede more than qualifies for that category. This year, the team penning event at The Greatest Outdoor Show on Earth has attracted 492 teams from across the western half of the continent, with about $225,000 in cash and prizes available in four classes over four nights of action at the Saddledome. Sunday’s purse for the Open Class totaled $34,220, including the winner’s share. Stampede success is not new to these American competitors. Joel Lesh and Sonya Buckner won the Open Class together back in 2009, the same year Jordan was part of the 10 Class’s winning outfit. Sunday night, the Lesh brothers and Brian Buckner put the exclamation mark on an exciting 10-team final round that put top-notch skills on display – and featured seven lead changes – before the American triumvirate sealed the deal with a 33.61-second run. Jordan Lesh and Buckner, in fact, were able to double-dip in the prize payout department. 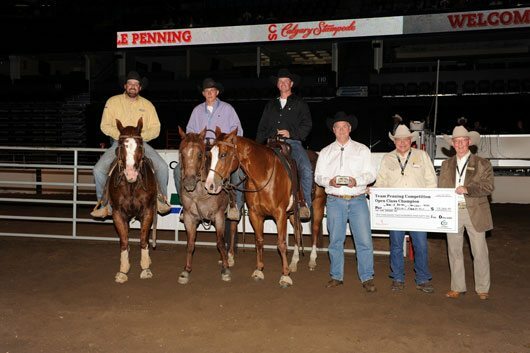 They also teamed up with Calgary’s Ron Scott to earn the reserve championship, collecting a runner-up cheque of $6,844 for their troubles. The Open is the feature class of the Stampede’s Team Cattle Penning event, in terms of horse and rider skill and experience. The competition began on Thursday at Okotoks Agricultural Society with 58 teams in the mix, and the first two rounds of competition narrowed the field to 20 for Sunday evening’s third round and final at the Saddledome. The Lesh brothers and Buckner never lost their grip on the lead Sunday – entering the third round with a cushion of more than five seconds, and pushing it to about 7.5 heading into the final. Their aggregate time on 12 head of cattle was 120.36 seconds, exactly two-and-a-half seconds over the reserve champion outfit (122.86). The three winning riders may be grizzled veterans in their chosen fields, but at least one of their four-legged equine companions performed admirably in a completely new arena. The third round and final of the 7 Class team penning event will be staged Monday, July 11 at the Saddledome, beginning at 5:30 p.m.